During an apparition to St. Gertrude, the Blessed Mother promised, "To any soul who faithfully prays the Three Hail Marys I will appear at the hour of death in a splendor of beauty so extraordinary that it will fill the soul with Heavenly consolation." Prayer instructions and holy card will be included with your chaplet. Beads: 14mm Faceted fire cherry quartz rondelles. Crucifix: A beautifully detailed cut-out crucifix with the Blessed Virgin and Mary Magdalene at the foot of the cross. Measures 2-1/4" high by 1-1/4" wide. Made in Italy. Medal: Spectacular 1.5" scapular medal with Our Lady of Mt Carmel on one side and the Sacred Heart of Jesus on the other. Made in Italy. Construction: Wire-wrapped with silver-plate wire. Why Should You Invest In A Wire-Wrapped Rosary? There are many beautiful rosaries being sold - some quite inexpensively - but most will not survive daily prayer for more than a few months without breaking. With wire-wrapped construction each bead is individually wrapped and permanently joined to the next - there are no open loops to come apart. As long as the wire is 20 gauge or larger this style rosary will never break during normal prayer. ~ Each loop should be consistent in size and shape. The ends of each wire will have been tucked under and filed. You should be able to run your hand up and down the length of the rosary without being stung by sharp edges. ~ All connection points should be secured with either bow-tie or smaller bead links. Manufactured chain is not as strong and defeats the purpose of wire-wrapping. The entire process of hand wrapping a rosary done properly takes five to six hours. The labor involved is what makes it more costly than a manufactured rosary - but this is most certainly a labor of love. Although nothing man-made is ever truly unbreakable, I guarantee my rosaries against breakage for life. If you break it during normal prayer, I'll fix it for free ... again and again and again! 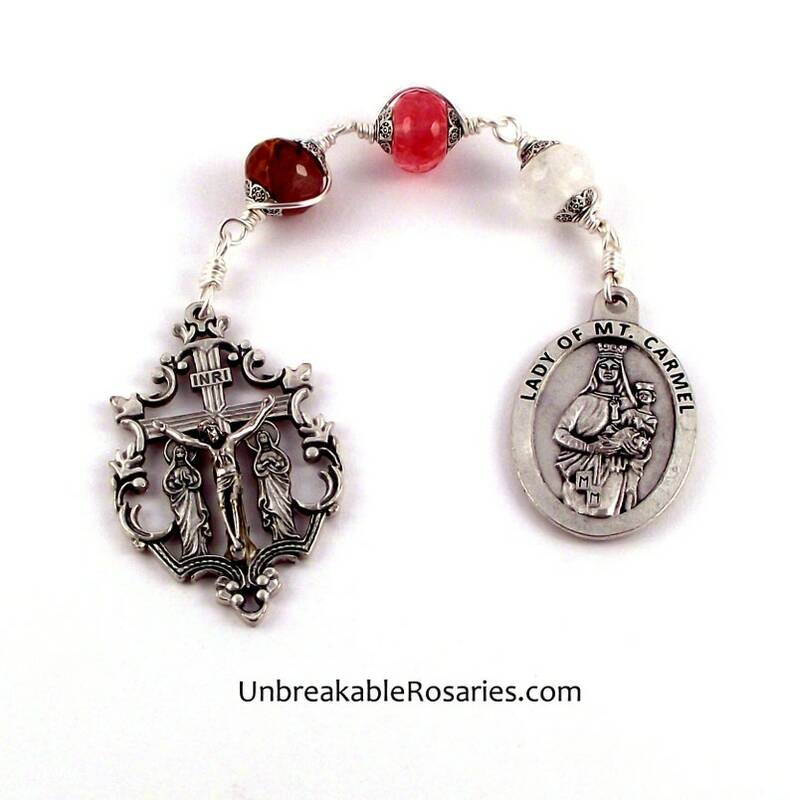 If you are looking for a beautiful, high quality rosary to last a lifetime, you will do well to invest in a hand-wrapped rosary - a treasure for today and an heirloom for the future.